Morning Glories, I love them. But I find them very hard to grow in Michigan. They aren’t reliable. I can’t depend on them. Obviously this isn’t true of other places, as you will see by following the links below. One year they took over the porch, even latching onto my porch swing. They were so thick they were like a wall closing us in. But no flowers. This year there isn’t much green, probably because it has been so dry, but they are blooming. Well, one plant is blooming, the other four aren’t, at least not yet. One year I got my first bloom the day before our first frost and Morning Glories don’t like frost any more than I do. I love the texture of the flower, like very expensive silk. And the color is so pure. Michigan doesn’t have many days of clear blue sky, so maybe seeing my morning glory fills that need. 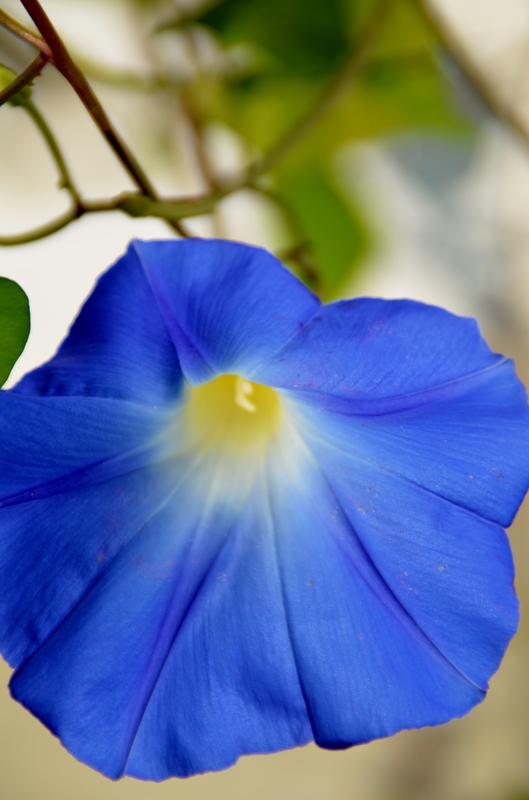 I have been trying for years to capture the beauty of Morning Glories in images but have always been disappointed. This week I upgraded my camera and am one happy woman. Of course I will continue to photograph them because in the case of this flower I doubt that the image can ever be as glorious as the real thing. I just looked out my window and today’s blossoms (both of them 🙂 ) have wilted. I’m so glad I have my images to hold me until tomorrow morning with the hope of some more blossoms. Enjoy! Thanks. I am really happy with how the photos turned out. You can’t even imagine how many disappointing photos I have taken. Thanks. The only blue like it is the sky on a low humidity day – something that doesn’t happen often here. 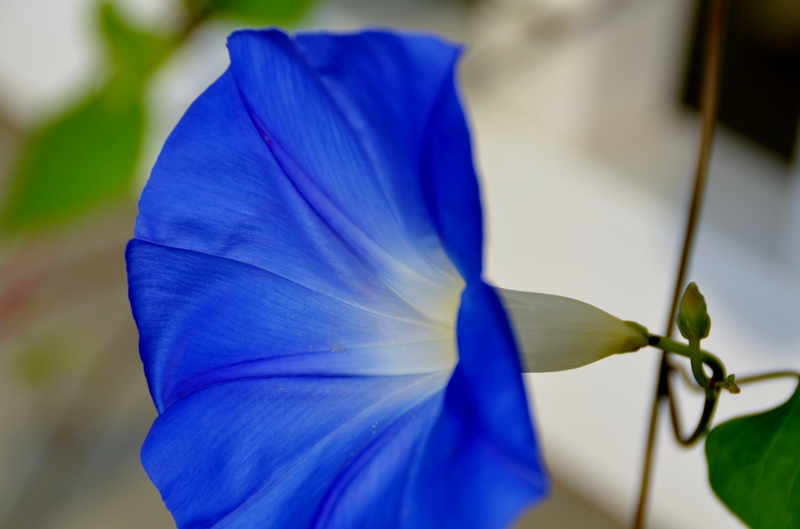 the blue morning glories are my favorites and these pics really capture the true blue. wow. Thanks – you gave me a big smile this morning because I have been trying to capture the blue for years. What was difficult is that the color is in the silky, delicate texture which was hard (impossible) to capture without a good camera and lens. What a beautiful blue! and your description of silk, is perfect … they look that soft. 🙂 Glad you updated your camera. We’ll be looking forward to more.